I had planned to put up a quick post yesterday highlighting one more small trade package I received, but I just didn't have the energy. I was plum tuckered out. See, I had to do some auto work yesterday. Major work at that. I always wonder what I look like to the guy (or girl) on the other side of the counter when I walk into the shop. I don't think I carry the whole "do it yourself" vibe. I don't dress that way. I don't have the working man hands of a DIY-er. I have worked in corporate America a good 20+ years. But I do my own auto repairs when possible because I just cannot afford to pay for them. 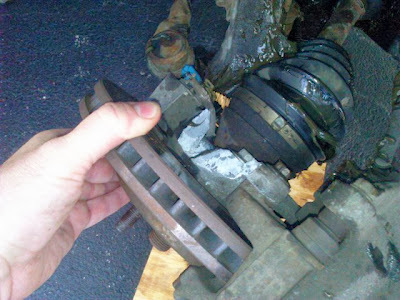 Oil changes, belts, A/C recharge, brakes and rotors, water pumps, alternators - you name it. When I am only paying for the parts, the cost drops. My project yesterday was my daughter's car. She got into a minor fender bender. On a car we purchased for her not 3 months ago. Not pretty. When the car was towed home, the wheel was resting on the underside of the fender. 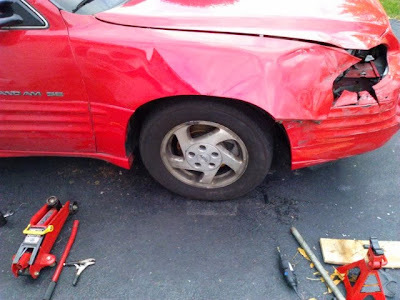 While the impact was pretty light, and no one was hurt, the other car caused the axel to break apart, and broke the knuckle, which was why it was riding so low. Needless to say, this would be my hardest repair ever. 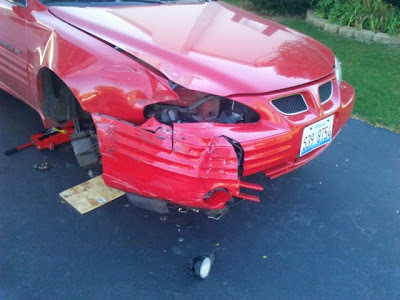 Oh, I could take it in and spend about a grand or more to get it fixed, but I decided to do it myself with $55 worth of parts from my local junkyard, along with a little neighborly help in the form of tools. I ended up having to put another $25 on the tab, as the outer tie rod was pretty shot and needed to be replaced, but after about 7 hours, we have this. Still need a new fender and bumper cover, but the headlamp is totally destroyed. I am looking at another $200 or so. It test drove fine for me, and my daughter just went over to her friend's house, so I think I pulled off a minor miracle. It's amazing what a lot of energy and hard work will reward you. Kind of like my 2011 Kimball Champions set (nice story transition, eh)? Paul from the little too quiet Baseball Card Snob (get blogging, dude) emailed me with a few needs he could help me with. I was able to find a fair amount to knock off his needs and the USPS did the rest, as in they got his package to me undamaged. I hope the same is true for mine. He hit my 2013 Topps needs, and 9 Kimballs. Yes, that is only 8 of them - my OCD wouldn't let one blank space be shown. However, when I posted the Kimball needs to my want list, I never thought I would be getting as close to finishing the set as I am. 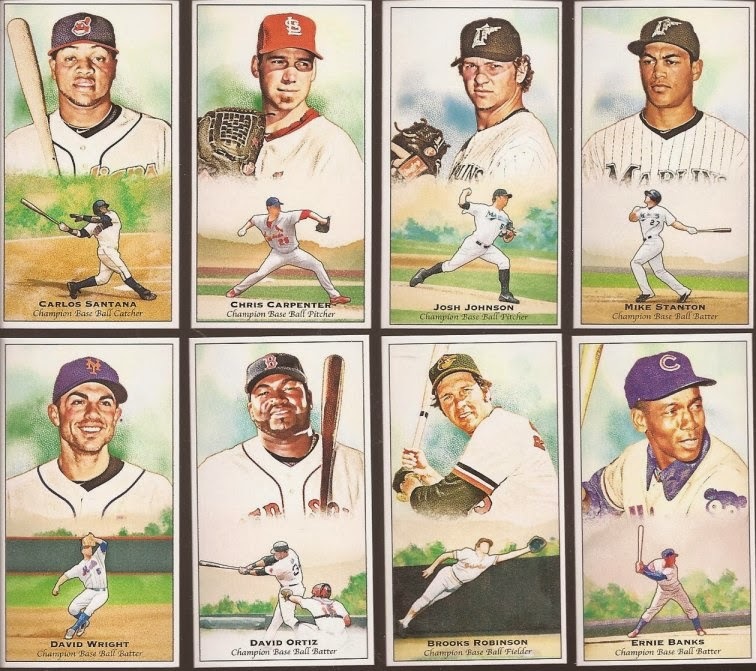 Still have 26 cards to go, and hopefully a few of you are sitting on some you are willing to part with. Nice job on the car! I consider myself pretty handy, but you in a different stratosphere. Wow... very impressed with your work. I haven't changed the oil in years... let alone fix an axel. That's one of my life's regrets. If I could go back in time, I'd spend more time in the garage with my dad. As for those Kimball Champions... they're awesome. But I was too lazy to build that set too. I ended up buying a complete set on eBay. I still need to buy some pages and put them in a binder for my viewing pleasure. Good luck with the rest of your set.